If you’ve ever wondered why your clutch judders, it could be because its warped or has hardened patches on it where it has got very hot. Most flywheels are made from cast iron. It is heavy, durable and relatively cheap. At Cranford Engineering we have a lathe that’s big enough to face off almost any flywheel from your standard small car to oversized truck ones. Local garages, individuals or transport companies bring their damaged flywheels to us because they know they get a good job. We remove the dowel pins and take great care to set the flywheel up in the machine accurately. 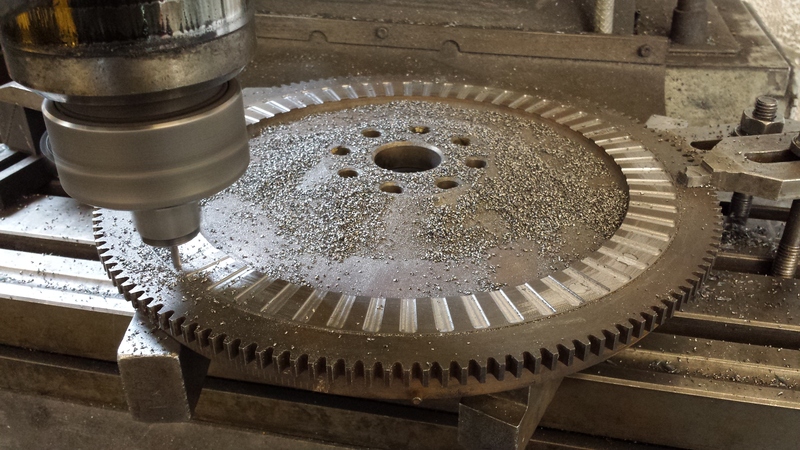 Using a carbide based cutting tool we machine the face and get a good finish. The end result is a flywheel that is flat and true with no surface cracks, heat spots or scoring. The flywheel in the picture is flat all the way across but it is much more usual to have the friction face below the pressure plate mounting flats. This make refacing slightly more difficult but we take care to remove the same amount of material from all the faces so that the clutch pressure plate maintains the correct operating pressure. Most times, the dowel pins are replaced with new ones. Racing enthusiasts might also bring us flywheels to be lightened or maybe even to have timing rings added to the back face.